You’ve probably seen them. It’s finally happened after years of talk, Facebook’s new emoji reactions now allow for five different post reactions. You and the 1.5 billion other Facebook users are now no longer limited by a simple ‘like’, you can can now post a heart (for love), a laughing face (for laughter), a surprised face (for surprised), an tearful face (for sad), a red face (for angry) and the classic thumbs-up (for like). Facebook is calling these new emojis Reactions. This is maybe the biggest update to the Facebook platform that we’ve seen this decade. Sure, Facebook is constantly launching new features, but this is an update for everyone. It doesn’t matter if you use a desktop, tablet or a phone. If you have a Facebook account you now have a lot more ways to react to another person’s Facebook post. That explains why these playful cartoon symbols are quickly taking over the Internet. This new functionality has been a long time coming. Ever since launching the ‘Like’ function in the fall of 2009 the company has been fielding questions regarding a ‘Dislike’ button. We’ve seen similar emojis on other online platforms, but with Facebook’s popularity across all demographics, many will be using them to communicate for the first time. Let’s face it, not every moment in life is a positive event. The ability to convey more than one emotion such as empathy or frustration is a natural human reaction. Facebook and other social media platforms work hard to integrate with our day-to-day lives, the ability to mirror the diversity of human emotion is an important factor in this marriage. Facebook did their homework. They consulted with professors at the University of California to develop emojis that were relatable and expressed a good snapshot of human emotion. The professors who specialized in non verbal communication found that a simple ‘Like’ button is very limiting. For example, ‘Liking’ a post or photo about a friend losing a loved one doesn’t seem to be an appropriate gesture. The new ‘Sad’ emoji button allows the ability to communicate a more fitting gesture. The Internet has taken Facebook Reactions to a new level over the last few days. Feeling limited by the six emojis introduced by Facebook, some cleaver folks have developed hacks that allow you to post custom emojis. With only a couple of clicks you can download a browser extension and post emojis featuring sets of Pokémon, Donald Trump and even our own Prime Minister Justin Trudeau. It’s all in fun, but it does show the magnitude of Reaction’s impact on Internet communication. As a Markham based online marketing agency we’re excited about the opportunities the new emojis present to Toronto businesses. Many big brands have fully embraced the Reactions on their company Facebook Pages. We’re seeing everyone from Dominos Pizza to General Electric now utilizing them. Chevrolet was one of the first brands to utilize Reactions as part of a social media campaign. They’ve launched a major campaign asking people to ‘love’ the 2016 Malibu. Facebook’s Reactions will provide a new understanding of how people feel and interact with your brand. The emojis provide a great way to express feelings quickly. A simple click of a mouse or a tap of finger can articulate how people feel about your brand or a post you’ve made. It’s important to encourage your social media audience to use Reactions by using them yourself in the content you post to your Facebook Page. It’s also fair to note that not all reactions may be positive. A red angry emoji can quickly lead to dozens more. Perhaps it’s more important than ever to stay connected to what’s happening with your social media and to quickly handle negative experiences. Remember, our brains can communicate anger and frustration much quicker with the minimal effort it takes to post a emoji as opposed to text. This added feedback could be a blessing for customer experience minded companies. Brands can quickly reach out to people posting negative emojis and provide a new level of online reputation management. This can lead to happy customers and new initiatives that can attract new customers. We’re really excited about the possibilities Reactions open up for creative brands. Imagine a comedy club launching a ‘laughing’ face campaign, or a not-for-profit equality group engaging followers to post ‘angry’ faces against a negative thing they’re fighting against. Ideally, the increased ease of engaging with Facebook content will lead to a better insight into what your audience likes and doesn’t like. This information can be extremely valuable and can help you develop future marketing initiatives. Measuring the emojis people use in addition to traditional metrics from Facebook Insight and Google Analytics will allow your company the ability to properly measure and react to your Facebook data. It’s still unclear how Reactions will effect how Facebook Ads are ranked and presented. Currently, Facebook weighs all emoji posts the same, a ‘Like’ is valued the same as an ‘angry’ or ‘sad’ face, but that could change at some point. Overall, the same social media rules apply to Toronto businesses that existed weeks ago. Post engaging content, post regularly, measure and create a Facebook Page that promotes two-way communication. 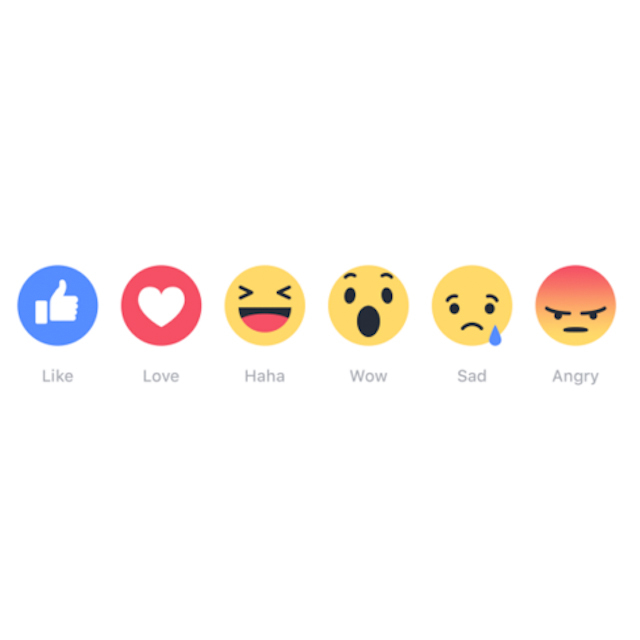 Facebook’s recent launch of Reactions is a great tool to increase audience engagement. Have fun with the new emojis on your company Facebook Page and your followers should do the same! Google recently announced a fairly major change to the way their desktop search page will display. Advertising on the right sidebar of the search page will disappear. Instead, users of Google will now see an additional paid advertisement above the organic search results. This will result in a total of up to four ads displayed on the top of Google search page, and three ads displayed at the bottom of the page. So, what does this mean for online marketing? Will we advertisers see more impressions, higher CTRs, better positioning and lower CPC? At this point it’s hard to say one way or the other, but here’s what we know so far. There will not be any text ads displayed on the right-side of Google’s search results page. Google will now show four advertisements instead of three on the top of their search results page. There will be an additional three text ads displayed on the bottom of Google’s search page. These updates will result in less total ads on Google. The total number of ads will decrease from 11 to seven. Content such as product listings and knowledge panels may utilize the right-hand real estate on Google search. It’s important for businesses running AdWord campaigns to take a deep breath and not panic. This isn’t the first change Google’s made to their Search Page layout, and it certainly won’t be the last. Being good at online marketing means you have to be good at adapting to change. Recent studies have found that most Google users click on the ads featured on the top of Google Search, only 7.3 percent of clicks actually come from the ads featured on the right-hand side of Google. By adding an additional ad in the top portion of Google Search, it’s fair to say that many of the clicks that normally occur on the right panel will instead happen on the top and bottom of search results. Utilizing Google AdWord extensions becomes even more valuable than ever before. These extensions allow advertisers the ability to add information such as phone numbers, sitelinks (additional landing pages), addresses, call out text, and reviews for free. In addition to providing useful information, ad extensions will allow your ads to take up more of Google’s Search Page real estate. Also, ads with extensions are found to generate more traffic because they resemble organic listings. This update will have a negative impact on businesses with smaller AdWord budgets. Campaigns with keywords ranking on the lower end of spend will no longer see their ads appear. Ads in the position of five to eleven will see the greatest decline in impression share. It’s important to spend time reviewing your Google Analytics and AdWord’s data to insure you’re getting optimum spend on high producing keywords and cutting back on the under-performing ones. Your SEO (Search Engine Optimization) may suffer the most because of this update. Google is now reserving more of it’s listings for paid search at the expense of organic. Paid position number four will now take the place normally reserved for organic listing number one. This update will result in paid search results taking up 36.4 percent of Google’s Search Page. It’s possible that the top organic result will now appear below the fold on tablets and smart phones. Again, the best solution for those concerned about their SEO is to innovate. Don’t put all of your SEO eggs into one basket. Diversify your online marketing efforts. Spend more time ranking your video content, local content, images and other organic content. There’s still a lot of room for having your brand appear in organic search, it’s now more important than ever to ensure that you produce high quality content on a regular basis. This in combination with an optimized Google AdWord’s campaign will put your business in a great position to succeed online, regardless of Google’s updates. Change isn’t always easy, but it’s part of the deal when you work online. It appears that this update from Google will actually benefit more people than it will hurt. Pay attention to what Google and your audience is telling you about your site, by regularly monitoring your data. Make updates when needed and ensure that your online marketing excels with this recent update.